Hi everyone, the guides have just returned to the dock on a foggy evening here on Langara. 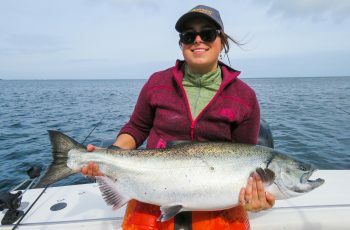 South West winds continue to dog us on the west side, but we are out there getting fish. 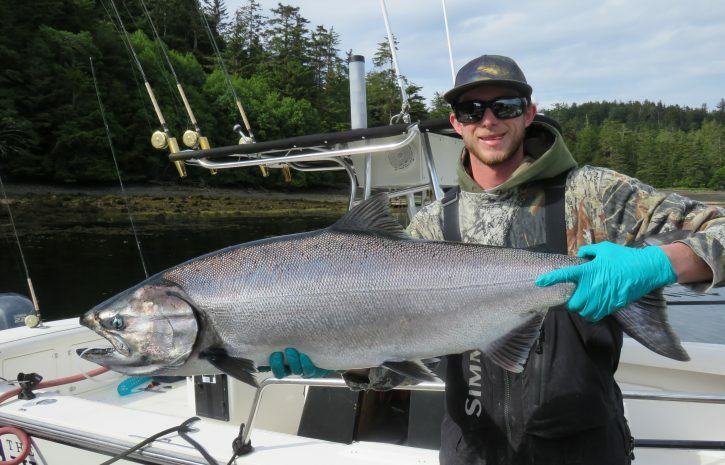 The east side is flat, but fishing is spotty for Chinooks. Huge schools of pinks are boiling on the surface from the nursery up to No name, figure up to half million pieces, early for these guys. 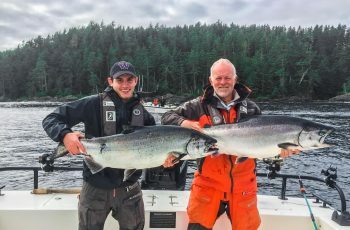 Our last trip included 14 tyee, with three fish in the forties and a 55 lber released in boat 3 for Calum Buchan. So some size there and all released, the norm around here now and thank you guys. Mike Blusson had a 39 out at Lacy in boat 6, Rick Venas had good fishing with a pair of 30,s. 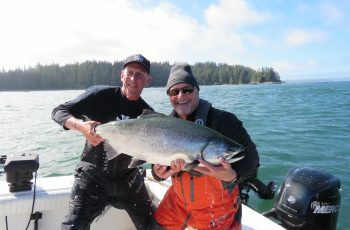 Mike Moran angled a 37 lb tyee, just some of the tyee I heard about around the docks and the scuttlebutt at the local dining hall. I saw Bryce load his plate last night with a chicken cutlet and two dozen colored gummy worms, life is good ! Halibut weather was in our favour and we went out to the ozone on a mission. 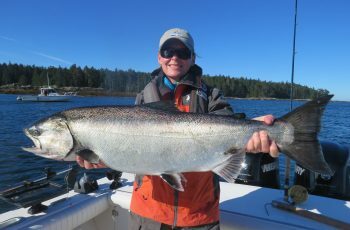 Yes, I did my yearly run with the anchor and managed to grab a nice 44 lber and slipped one much bigger into the box. Took me all afternoon though, Bryce released a 200 plus for Michael King , well done boys. Boat 17 hooked an octopus, and played it for an hour inching it up a few feet then back down she went. Ya, right, my senses tell me they had ground line or expired fishing gear wrapped around a rock pile, but hey good humour, an Octopus? Wow! The springs hit this afternoon were mostly high teeners hooked in the deep, chasing bait balls, fishing a 100 feet off the rigger. Thank you Scotty for inventing this tool, how can you ever fish without one in 30 knots and a strong tide. 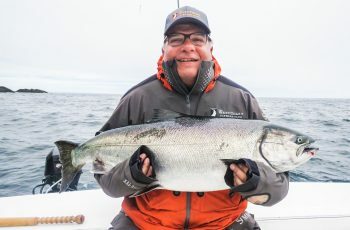 Sure the kelp is a curse at times, but if an angler needs to get down to the bait fish, in wind, there is no other effective way…I guess 75 pulls, yuk, done that, no thanks.